The Municipal Art Society (MAS) , founded in 1893 has a long tradition of public advocacy and cultural awareness of New York City’s legacy spaces, including its historic landmarks and legacy districts. In 1983, the Society questioned proposals for the radical transform the fabric of the Times Square theatre district, including Times Square itself, New York’s famous “Crossroads of the World.” The 1984 Municipal Arts Society Times Tower Site “Ideas” Competition of 1984, in conjunction with the National Endowment for the Arts, responded to the widespread negative public opinion of proposals to transform the area – both monotonous and monumental – which included demolishing the remains of the original Times Tower. 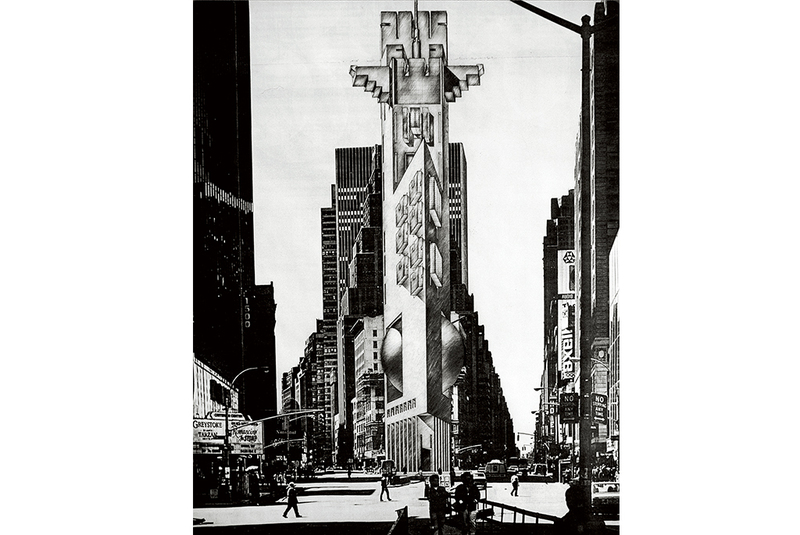 The concept design for The Times Tower Site Competition by George Ranalli Architect was included in both the 1984 MAS exhibition, at the Urban Center, covered by Paul Goldberger, in The New York Times, and the 2014 Skyscraper Museum exhibition, entitled “Times Square, 1984: The Postmodern Moment,” reviewed in The Times, by Joseph Giovannini. George Ranalli Architect proposed a Times Tower attuned to its historic context and civic identity. The proposal interprets the programmatic objects for new performance space and a refurbished 42nd Street subway station. At the base, a large street-level lobby space mirrors the enlarged subway entrance below. Above, a tower holds a distinctive sphere-shape volume with space for a large arena-style theater, and a stage set slightly lower than the audience. The design is equally well suited to high octane performances and classical stage productions. The spherical space is connected to upper floors, for rehearsal and production, media, exhibition, and educational programming. Toward the top, the tower expressed two wing-like projections, cantilevered from faceted shafts, each a space for a traditional proscenium theater, including a flexible proscenium arch, main and rear stage, orchestra pit, and dock-to-stage loading. The new Times Tower assembles this collection of new theaters on the existing site.